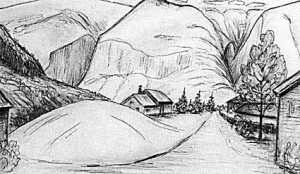 Onstad was formerly the centre of Aurland. The lensmann (local police chief) lived here and the courthouse was here too. This is where the main farm building and Lensmannsstova were located. The lensmann farm at Onstad was one of two (later three) farms in the area. The farm, which has many burial mounds, is one of the largest in Aurland and has a great deal of flat land. This was the lensmann’s farm for five generations from about 1700. The fifth and last of the “old” lensmenn retired in 1912 and died in 1929. The farm retains the name Lensmannsgardento this day. The residence of these lensmenn was Lensmannsstova, which is believed to have been built in the first half of the 19th century. At that time it stood in the yard close to the main building, but was moved a little further away in 1953. Aurland Sogelag then began collecting historical items here and turned the building into a museum. The white main building in the yard may have been built during the 18th century. It housed the lensmann’soffice and was also used as a guest house. At the turning of the millennium the building was still in use as a home. Lensmannsstova is currently closed to the public. The tinghaug or court mound at Lensmannsgarden is of uncertain age but was the ancient site where justice was dispensed, probably from the time of King Håkon the Good. It was he who introduced the first formal local courts at the end of the 10th century. It was probably in use until the Black Death arrived in 1349. The 16th and 17th centuries had circuit courts. In the 18th century more permanent courts were established and an official permit for a the court to be held in the guest house here was issued in 1737. This remained the site of the courthouse until the 1870s, when it was moved to Vangen with the opening of the bridge over the river.